This book has the most intriguing premise of any that I've read in a long while. Set in the not-too-far-distant future, it features Hank Palace as a fledgling detective in Concord, New Hampshire. One night, Hank is called to the scene of a suspicious death in the restroom of a McDonald's restaurant. An insurance man named Peter Zell is lying on the floor with an expensive leather belt wrapped around his neck. The other end of the belt is tied to the handicap grip bar next to the toilet, and the officer who discovered the body has called it in as a 10-54S, that is, a suicide by hanging. Sad to say, there's a lot of that going around these days, ever since astronomers discovered that a giant asteroid, designated 2011GV, is swinging around the sun in preparation for slamming into the earth at about a billion miles an hour six months hence. The damned thing just came out of nowhere, one of those giant rocks that occasionally passes "near" to Earth but not close enough to be a concern. When 2011GV first appeared in distant space, all the "experts" insisted that it too would pass by harmlessly and that there was no need for concern. Turns out there was, and there's nothing anyone can do about it. The friggin' planet is about to be destroyed. As one might imagine, a lot of people are upset about this and some changes have occurred in the wake of the news. The world economy has collapsed; there's a lot of turmoil everywhere; governments have assumed emergency powers, and so forth. Lots of people are killing themselves; a lot of others have quite their jobs and are devoting their last six months to fulfilling life-long dreams. Then there's Detective Hank Palace, who's doggedly determined to keep doing the job he always wanted for as long as he possibly can. The truth is that, at this point in time, no one really gives a rip what happened to Peter Zell and how he wound up dead in the McDonald's restroom. But Hank does. The death looks suspicious to him and he is determined to investigate it as a murder until proven otherwise. 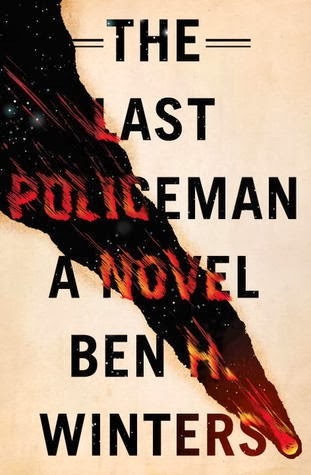 the book details his investigation which is, as you might imagine, a little out of the norm for a police procedural, given the death sentence hanging over everyone on the planet. It's interesting to watch Hank work, and one admires his determination. Either that, or you question his sanity. It's also intriguing to watch how the rest of Winters' cast reacts to the coming of the end of the world. 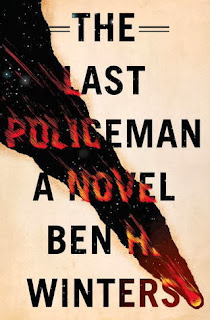 Any fan of police procedurals and looming apocalyptic novels will probably enjoy this book. (view spoiler) I do have one complaint about this book. I am compulsive about never reading a book's tease before beginning the book. I don't want to know anything about the plot until it unfolds in the course of the story. As I approached the end of the book, I was very anxious to see how the author would treat the final moments before the big collision between the asteroid and the Earth. Except that he didn't. The book ends with several months still to go before the big event, and only then did I read the back cover and realize that this is only the first volume in a projected trilogy. I was hugely disappointed to learn that I would have to wait two more books before getting to the moment I was anticipating, and I'm not sure if I'm willing to do that, in large part because, although the premise is very intriguing, I'm not sure that it can be sustained over the course of three books rather than the one I was expecting. Also, I'm not sure I was enamored enough of Hank Palace to want to read two more books with him as the central character. This is a case where I'll probably wait to read reviews of the next two before deciding if I want to continue with the series.